I went down to the Open 08 exhibition in Wolverhampton today. Open 08 “showcases some of the best artists based within the region”. It’s a neatly-presented exhibition and there are many pleasures in the two rooms. There’s also a more general pleasure to be found in Open 08, in that the curators have mostly avoided one of the main problems — a superb technique applied to humdrum subject-matter — seen in many county and tri-county ‘open’ art shows. One work in particular gave me a physical shiver — the magnificent large canvas “Black Country Night” by Robert Perry (7′ x 6′), although the frame was mediocre. Jessica Callan’s semi-interactive sculpture “Portrait of a Living Dog” also raised several chuckles. The rest of the works noted below only worked for me intellectually, but work they did. By the entrance, David Miller‘s large photograph “Doom 3” sums up both the ‘chrysalis’ essence and the ‘shut-away’ conformity of the goth subculture. Also take a look at Miller’s “Theatre” series on his website. Caroline Ali‘s “Bee and Fly Studies” is magnificently detailed, and evokes the best pencil & watercolour nature studies of the 19th century artists who took Ruskin’s dictum… “go to nature in all singleness of heart” to heart. 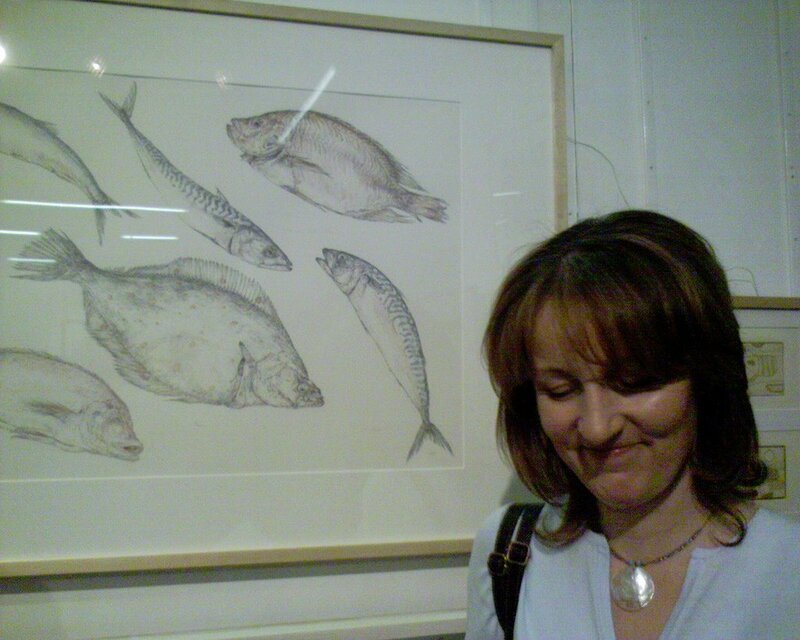 Unsurprisingly, Ali was shortlisted for The Jerwood Drawing Prize in 2007. Her “Bee and Fly Studies” is neatly paired with Sandra Masterson‘s large and deliciously-earthy hanging “Haldon Forest (Soil Samples)”. It was good to see a half-dozen works with strong pop surrealism / lowbrow leanings, fitting choices for a gallery with perhaps the strongest collection of Pop Art outside London. Ryan Patrick Everson’s fabulous painting of a boy and his monsters (6′ x 5’) was for me the most impressive of the lowbrow works, and it repays close attention to the details. Amazingly, Everson’s distinctive name is almost completely unknown to a Google search — someone please get this artist a website. The show also squeezed in some video art and installation, but so far as I could tell there were no interactive / computing-powered works. Of the two installations, Sabrina Stumberger‘s “Memories No.2” was the most intriguing — a tiny room with a wall of glass rods, onto which was projected a beautiful video loop of an almost-never-glimpsed face. I went around the show twice, and was very pleased I went — although I don’t think that Wolverhampton have the lighting-design in their impressive and newly-built extension quite right yet.